Well it just is, but then that wouldn’t be much of a blog post would it. Through my photography I’ve been lucky enough to experience flight in a multitude of different aircraft, be that fixed wing or rotary wing. They’re all different; they each have their own appeal and drawbacks, especially when using them as a photo platform to shoot from or as a subject. Admittedly I don’t get the same sort of buzz or adrenaline rush I get when compared with military aircraft, the same can also be said for the flying. I love flying aerobatics (for as long as I can hold off the sickness feeling) but it doesn’t quite compare to flying at low level in the cockpit of a helicopter, I’m sure others would disagree though. I still love it, just in a different way. The British Aerobatic Academies extra EA-200 wearing a DHL livery. The start of this year has been heavily orientated around GA aircraft shoots so far, and its been bloody good fun. Obviously whilst planning these kind of shoots safety is a big aspect, especially with air to airs. You need to know the correct procedures; most of this falls to the pilots but you need to be able to stay safe in the air. Most importantly keeping free and clear of the controls, a stray camera strap caught on the yoke/control column could be fatal when flying in formation. So a safety briefing is essential. Adrian Willis breaks away from the camera ship in his DHL livered Extra EA-200. Luckily we managed to strike on a fantastic day for weather, albeit cold but what else would you expect at the start of January! The camera ship being used was a Cessna Cardinal, ideal as it’s a high wing design and there are no struts in the way. The subject was an Extra EA-200, flown by Adrian Willis of the British Aerobatic Academy based at Bourn airfield, Cambridgeshire. With morning filming completed and the briefing done, we secured the backseats back in to the cardinal and began the pre-flight checks before starting up and rolling out for take-off. Adrian formatted on us in the Extra and performed some high energy breaks and close formation, ideal for both stills and the video we were shooting. About 10 minutes in we suffered a radio failure, have no means of verbal communication between the camera ship and the subject aircraft is by no means ideal, luckily Adrian grasped that we had lost the radio and were able to answer yes or no questions with a waggle of the wings. Whilst checking for aircraft in the proximity we made our way back to Bourn to land and see if there was a fix for the dicky radio. Smoke on, go!! 2000ft above Cambridgeshire with G-EEEK. 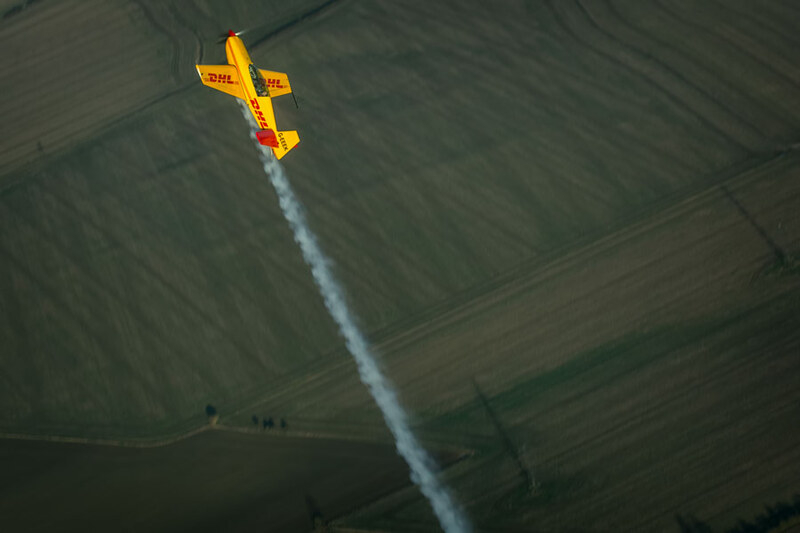 Adrian performs high energy aerobatics above Cambridgeshire. Radio fixed, another brief done and airborne again it was time for a more dynamic sortie. 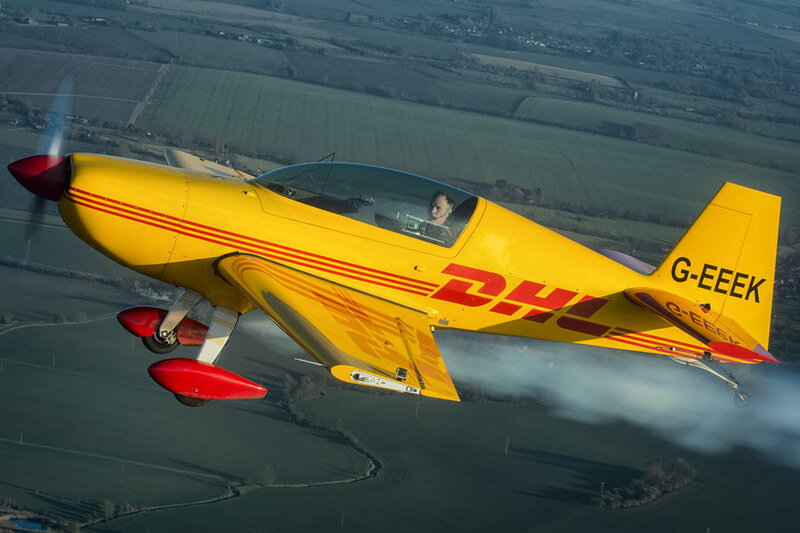 We flew a holding pattern at 2,150ft in the Cardinal whilst Adrian flew some high energy aerobatics in the DHL liveried Extra, being able to film and photograph from above provides a more dynamic point of view resulting in more interesting footage and stills. Unfortunately it was too short notice for me to rent out my usual go to lens for something like this, the Nikon 24-70mm F2.8. I had to use my Nikkor 70-300 VR lens alongside my first ever lens, an 18-55mm kits lens. Not ideal but sometimes you have to make do, if you know your kit well enough you can still get the shots that are needed. Lauren Richardson in her Pitts S-1S special over the water at Craig Goch reservoir. Another standout shoot was with Lauren Richardson, a female aerobatics pilot who is gathering quite the following on social media and the air show scene, rightly so too. If you have followed her progress you’ll be aware of the amount of hard work Lauren has put in over the past few years, she now owns her very own Pitts S-1S special. We had been talking about the prospect of a low level shoot for a few months, ideally trying to tie it in with some filming as well so Lauren could use it for her promotional video. The location of choice was Craig Goch reservoir in the Elan Valley, a spot that I’ve used before when shooting an owners Christen Eagle II, similar in some respects to a Pitts. We're going up! Lauren pulls in to a hard vertical climb. I shot this at 1/80th sec so that there would be a reasonable amount of prop blur and motion in the background. The location is ideal for a shoot like this, a hill on the eastern side of the reservoir that provides great views over the water but more importantly the height provides the ideal angles that Lauren wanted, providing something different than the normal air-to-air images for her promotional photos. As ever the weather gods teased with fantastic weather for the whole morning before Lauren arrived at the location, when it duly clouded over for the most part of her 20-minute display there. Luckily there were a few breaks in the cloud which made for some really great photographs, as exciting as air to air images are you can get some very unique angles for promotional photos such as these. Showing off the branding on the leading edges of her Pitts S-1S special. Obviously something like this should not be undertaken by everybody, the dangers are very real, Lauren has a lot of experience as well as a display auth meaning she regularly flies the same sort of profiles during her displays at air shows.